Walt Disney World is a pretty awesome place. I know that, you know that. That said, there aren’t many restaurants in Walt Disney World that can be described as perfect (at least in the mind of this author). Even favorites, like Kona Cafe (too noisy and poor ambiance) and Le Cellier (tables too close together for ‘fine dining’), that are great have their faults. Most of the time, these faults are fairly unsubstantial, as you can have a great experience at these restaurants, all things considered. In an imperfect world, there’s one light of perfection. It’s called…Beaches & Cream Soda Shop. In my mind, it’s the one (okay, maybe there are others…) truly faultless Walt Disney World restaurant. The location is great, the soda shop ambiance is on-the-money, the prices are very reasonable, it doen’t accept reservations so you can spontaneously grab a table very easily (although avid planners would perhaps deem this a fault), the burgers are delicious, oh, and there is ice cream. Perhaps I didn’t emphasize that last point well. 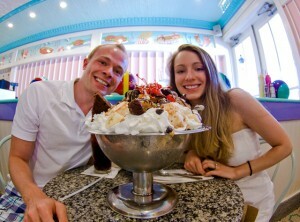 BEACHES & CREAM HAS THE MOST AMAZING ICE CREAM CREATIONS KNOWN TO MAN. In case you’ve never eaten at Beaches & Cream, and the above list seemed unimpressive, let me elaborate a bit. First, the bygone-era All-American soda shop ambiance. 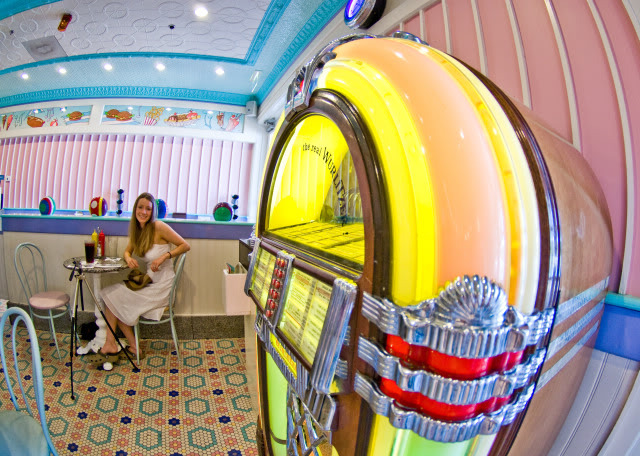 While Beaches & Cream is very small, with its working jukebox, pastel colors, partially open-air kitchen and bar-style seating, the place is a lot of fun. 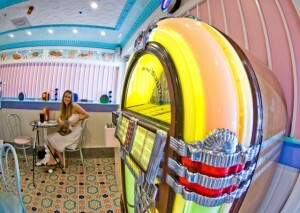 I wasn’t alive in the 1950s, but when I step into Beaches & Cream, I feel like I’m Marty McFly in Lou’s Cafe. It makes me want to walk up to the counter and order a cold sarsaparilla. Oh…I’m sorry, I forgot, we’re drinking root beer now! Same kind of thing, different name. Well, that’s progress for you. If you want the ultimate in ambiance, order the Kitchen Sink. If you do, the cast will put on a bit of a show for you as this ginormous creation is brought to your table. If you have kids, they’ll love the spectacle, and they’ll probably like the odd concoction, too. The Kitchen Sink includes a ladle of Chocolate Fudge, Ladle of Butterscotch, Ladle of Peanut butter, 2 Scoops Vanilla Ice Cream, 2 Scoops Chocolate Ice Cream, 2 Scoops Strawberry Ice Cream, 1 Scoop Coffee Ice Cream, 1 Scoop Mint Chocolate Chip Ice Cream, Pineapple Topping, Strawberry Topping, Entire Banana, Muffin, Entire Can of Whipped Cream, Large Brownie, Angel Food Cake, Entire Milky Way Bar, 4 Oreos, Every single type of sprinkle in the house, Chocolate Syrup, Marshmallow Topping, and topped with a handful of Maraschino Cherries. Make sure to bring your appetite! The Kitchen Sink is definitely the most ‘fun’ dessert and something everyone should try once (Sarah and I accepted the challenge on our honeymoon! ), but it’s definitely not the best. If you want the best, The Milky Way Sundae, Fudge Mudslide, No Way Jose, and Banana Split are all legendary Walt Disney World desserts. Try them. You might just want to skip ordering an entree all together in favor of a few of these desserts. You’re on vacation, so why not?! Plus, what’s more romantic than bringing your favorite gal or guy to Beaches & Cream, sharing some ice cream, and getting groovy to the tunes on the jukebox?! The biggest reason why you shouldn’t just order ice cream is that Beaches & Cream is famous for having some of the best burgers in all of Walt Disney World. Now, I don’t think they’re as good as the gourmet burgers at some table service restaurants, but the Beaches & Cream burger is $9.49, which is less than some counter service burgers! Given its price, it’s a pretty extraordinary burger. Definitely better than every counter service burger I’ve ever had! Other options on the Beaches & Cream menu look appealing and are similarly inexpensive, but you can’t go wrong with that burger. Speaking of price, Beaches & Cream’s prices are part of what makes it perfect: it offers incredible value for money! With the possible exception of the Plaza Restaurant on Main Street, there are no cheaper table service restaurants in all of Walt Disney World. At Beaches & Cream, you get a table service experience for counter service prices! When I labeled Beaches & Cream “perfect” above, some of you might have started thinking of dozens of restaurants that are better than Beaches & Cream. And there certainly are plenty of restaurants that have better cuisine (even though I think a burger and No Way Jose from Beaches & Cream is pretty tough to top!). At how many of those restaurants can two people eat for less than $30, though? Probably none. In comparison to restaurants in its price range, Beaches & Cream has no equals. The one place where Beaches & Cream might stumble, for some, is that it does not accept Advance Dining Reservations. As I mentioned at the outset, I see this as a strength, as I don’t have to plan my meal out 180 days in advance like I would with Chef Mickey’s or other popular restaurants. Beaches & Cream regulars know the best times to go to avoid the crowds are right when the restaurant opens or for a late lunch. Lunch hour and evening crowds can be pretty substantial. Given all of this, I think it’s pretty clear that Disney has achieved perfection with Beaches & Cream. From the All-American 1950s decor (to not enjoy the ambiance in Beaches & Cream is distinctly (wait for it) unpatriotic) to the reasonably priced and delicious burgers to the best ice cream at Walt Disney World, you couldn’t ask much more from this quaint little soda shop. The next time you’re wandering Epcot in the afternoon, pass up those overrated fish & chips in the World Showcase and head to the Beach Club for a real treat! Do you agree that Beaches & Cream is perfect, or is it just another place to get ice cream and burgers in Walt Disney World? Share your thoughts in the comments. I don’t know what I love more, Beaches & Cream or how you expertly wove in a Carrousel of Progress reference into your review (the answer is obviously B&C!). I had the cheese steak when I went and it was delicious. Then topped it off with a sundae of vanilla ice cream with butterscotch and marshmallow topping. 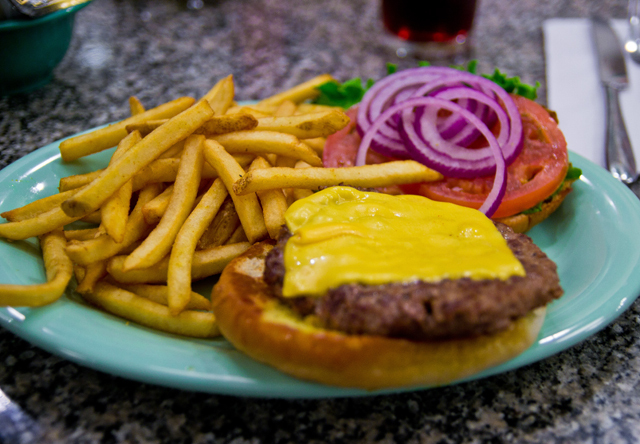 As you point out, you really can’t go wrong with anything at B&C! Yep, I have to agree with Tom on this one! We first ate at Beaches & Cream in 1997 on our first trip on property, and it is a must do on every trip since, and there have been many! Sometimes I wish B&C was bigger, but that would take away the ambiance of the place. What I really love, in addition to everything Tom lists, is that many of the servers have been there for several years, so it’s really like going to your favorite soda shop in town! I completely agree with you about Beaches & Cream. I most have a burger, onion rings, and No Way Jose on each trip. If you ever just want one of the burgers and it is to long of a wait to get into B&C the poolside bar at the Beach Club serve the same burger, then just go up to the ice cream window at B&C for dessert. Thanks for the heads up and another great article! 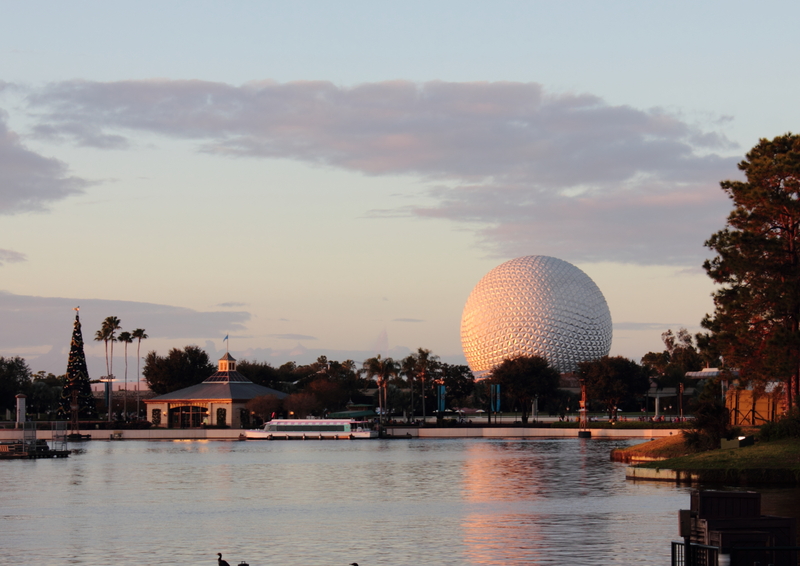 We’ll be in Epcot on the June 6th and the 10th. What a great place to escape the crowds and the lines at the counter services for lunch or dinner. 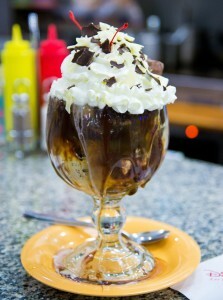 I can’t wait to dig into a Mudslide… Yum! Excellent argument, Mr. Bricker. I have been to Beaches & Cream more than any restaurant at WDW, starting in high school when my server, Brandon, thought my friends and I were skipping out on the bill. Ah, memories. In retrospect, I should have left him a smaller tip. It’s also an excellent place to visit after running a race. A double cheeseburger and No Way Jose are a great way to replenish lost calories. Also, my wife and I almost always get stuck at the table for two where your wife is sitting. The No Way Jose (I like mine with all vanilla ice cream) is to die for!! It’s a must for us to visit B&C each trip. Definitely a fave. The chocolate milkshake is the best ever, the cheeseburger is the best ever and the onion rings are the best ever. Nuff said! I agree about the ice cream creations, the price and the decor, but the burger is totally forgettable. Multiple people have told me the Beaches and Cream burger is the best WDW has to offer and that may be true but it is also very, very sad. I have a few burgers left to try on property and I am really hoping to find a better burger option.